This report is a major update to a similar one posted a few months ago. I'll deliberately skip through some of the history to get us to the most important part of the story, and that's finding the latest images of the Blair Cuspids on at least three other LRO missions!!! So, if you are familiar with the story, itself, and of the discovery in 1966, the "disappearance" in later years, and the re-discovery in 1996 by The Lunascan Project, just skip over the next few paragraphs. In November of 1971 I had read about the strange "towers" found on the Moon by NASA. 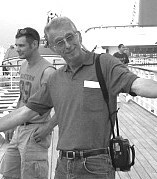 William Blair, was a member of the Boeing Company's biotechnology unit, and he had emphasized that he was not asserting that the spires were the work of a transitory intelligence, but be did say this: "If such a complex of structures were photographed on earth, the archaeologist's first order of business would be to inspect and excavate test trenches and thus validate whether the prospective site has archaeological significance." Blair had gone over the photo with a compass and protractor and had found that the "spires" formed a basic X, Y and Z right-angle coordinate system, six isosceles triangles and two axes consisting of three points each. The scientist discovered in the photo what appeared to be a large rectangular shaped depression or pit directly west of the largest "spire", estimated to be as tall as 70 feet. Blair said the shadow cast by this depression seemed to indicate four 90-degree angles and resembled the profile of an eroded pit structure. The moon spire photo was analyzed by Blair the same way he once used aerial survey maps to look for possible prehistorical archaeological sites in the southwest United States. Most space scientists of Boeing, which had built Lunar Orbiter, believed the spires were the result of some geophysical event and they discounted Blair's speculations. Dr. Richard V. Shorthill of the Boeing Scientific Research Laboratory, an expert on moon topography said, "Pick some (objects) at random and you eventually will find a group that seems to conform to some kind of pattern." But Blair responded: "If this same axiom were applied to the origin of such surface features on earth, more than half of the present known Aztec and Mayan architecture would still be under tree and bush studded depressions....the, science of archaeology would have never been developed, and most of the present knowledge of man's physical evolution would still be a mystery." In late 1995 I began to look into the Blair Cuspids. In the summer of 1996 I had set up The Lunascan Project, and one of the very first things we wanted to do was to check out that image. The VGL group of Mike Lomax, Lan Fleming, John Floyd and Bill Koehler went to work on the photo. The image with the cuspids turned out to be LO2 61H3 (Lunar Orbiter II, not III). After several weeks of research & investigation we had re-discovered the Blair Cuspids and their actual location. This strange formation was on the lunar Near Side in the Sea of Tranquility. With the aid of David Williams of the National Science & Data Center in Greenbelt, Maryland, I was able to get a second image, LO2 62H3, taken 2.2 seconds later and the Cuspids had moved to opposite edges of the camera's field of view in that time. One must read all the data for this extremely interesting find. Halfway up and to the left one can see the long shadows cast by the mysterious "Blair Cuspids" in Lunar Orbiter 2. In 2001, Mars Project image specialist, Mark Carlotto, conducted an extensive 3D analysis of the Blair Cuspids and the surrounding terrain. His findings, published in Frontiers In Science reinforced ours and added other important conclusions. In the same year Lan Fleming & I published our report in Frontiers In Science. It was very important to science for someone to go back to the Moon and take a second and closer look at the site sometime in the future, with different sun angles and greater resolution. Eight years had passed since our intense interest and we had thoroughly discussed all the issues and details, and I drew up a mission plan. TransOrbital was planning on sending a privately-funded orbiter to the Moon to conduct live imaging of the lunar surface at 50 km up, then finally, barn-storming imaging at 10 km!!! I emailed Dennis Laurie, TransOrbitals' Public Relations man on January 10th, 2004. Six days later Laurie advised that he had forwarded my plan to the CTO, Paul Blase, for consideration. "It looks like a very promising opportunity to solve another 'mystery' ", Laurie wrote. The Trailblazer orbiter spacecraft was built, a launch vehicle was purchased. But TrailBlazer never got off the ground. They couldn't launch in the U.S. and the State Department wouldn't allow Russia to launch it. NASA's new orbiter was launched in June to orbit around the Moon, taking live and very high resolution images of the surface. It was supposed to be a 1-year mission but was extended several times. An interesting article appeared in UNIVERSE TODAY in April of 2012. "ASU Researchers Propose Looking for Ancient Alien Artifacts on the Moon". What caught my eye immediately was an image of the Blair Cuspids, Two researchers at Arizona State University had made a rather controversial proposal: have the public and other researchers study the high-resolution photographs of the Moon already being taken by the Lunar Reconnaissance Orbiter (LRO), to look for anomalies that may possibly be evidence of artifacts leftover from previous alien visitation, possibly thousands of years ago. The theory is that if our solar system had been visited in the past, the Moon would have made an ideal base from which to study the Earth. The paper had just been published in the journal Acta Astronautica. Professor Paul Davies and research technician Robert Wagner admit that the chances of success were very small, but argue that the endeavor would be worth the minimal investment required. The photographs were already being taken on a regular basis by LRO. Any interesting finds could be examined by others including imaging professionals. Shape-recognizing software could also be used to help discern any possible artificial artifacts from natural ones. What a lot of people did not know was that ASU had been contracted by NASA to receive, process, and catalog the images and data from the Lunar Reconnaissance Orbiter sent to the Moon in 2009. Paul Davies and Robert Wagner had written two papers the year before. And maybe somebody had thought that imaging the BCs was important enough that they imaged them at least three different times! And the data as seen from the ActReact Map indicates at least one other undisclosed mission, but more on that later. Another person in the cast of characters was John Keller. His credentials include: Space Plasma Physics Instrumentation and Lunar Remote Sensing using plasma instrumentation and relevant laboratory measurements of particle surface interactions. Atomic and Molecular Physics of Astrophysical Significance. Keller was the Project Scientist for the Lunar Reconnaissance Orbiter Mission, NASA/GSFC, Greenbelt MD. We had coordinates of the BC's and were having trouble finding them on any LRO image strip, but one frame in particular was found. And there didn't seem to be much luck in finding the targets on that frame. On May 4, 2015, I received an email from Keller. This was in response to a previous request to find the BC's on an LRO image based on coordinates we were aware of. He knew what frame we were looking at and recommended downloading of image M159847595LE as the highest resolution available at 0.5 m/pixel, taken during the 50 km mapping orbit. This wasn't to say the BC's were ON the frame, but he had given us the best version of the strip to look over. 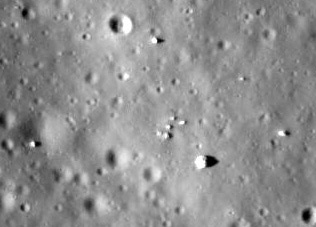 "We briefly did an equatorial dipping orbit that brought us down to as low as 20 km (12 miles) for the purpose of imaging the Apollo landing sites and other areas of interest but I don't think we imaged your target. (italics mine) Due to limited propellant we have since moved into a low-cost elliptical orbit where over that latitude the spacecraft is roughly 100 km above the surface, so any future imaging there will be lower resolution. Note that while there are limited areas for which Lunar Orbiter resolution is higher than LRO one should also consider other factors for image quality, such as dynamic range, linearity, etc." That's where we were until a gentleman by the name of J. Fincannon of Moon Zoo Forum came into the picture. He had found not only the BCs on the frame we were already in possession of, but on two additional LRO mission frames!!! 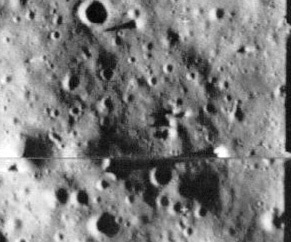 Shown above is a cropped version of the original Lunar Orbiter II image. The Sun elevation is 11 degrees. The shadow length (using LRO data to measure the distance between the surface features) of the widest object is about 113 meters. The location based on LRO coordinates seems to be 5.024 degrees N latitude and 15.58 degrees E longitude. The LRO image (http://wms.lroc.asu.edu/lroc/view_lroc/LRO-L-LROC-3-CDR-V1.0/M159847595RC) shows the site at 1755 pixels from the left and 23760 pixels from the top (perform a 180 degree rotation to get the site oriented correctly). The Sun elevation is 42 degrees and the slew angle near zero with a pixel resolution width of 0.4 m/pixel. A cropped/rotated version is attached. The LRO image (http://wms.lroc.asu.edu/lroc/view_lroc/LRO-L-LROC-3-CDR-V1.0/M181066153RC ) shows the site at 3120 pixels from the left and 741 pixels from the top (perform a flip about the horizontal axis.. up/down are flipped to get the site oriented correctly). The Sun elevation is 23 degrees and the slew angle near zero with a pixel resolution width of 1.14 m/pixel. A cropped/flipped version is attached. 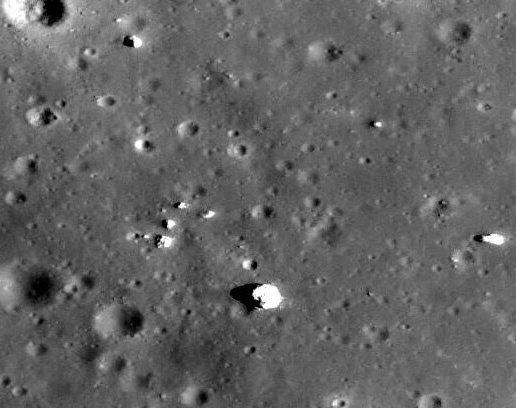 The LRO image (http://wms.lroc.asu.edu/lroc/view_lroc/LRO-L-LROC-3-CDR-V1.0/M192853500LC ) shows the site at 3402 pixels from the left and 16903 pixels from the top (perform a 180 degree rotation to get the site oriented correctly). The Sun elevation is 20 degrees and the slew angle near zero with a pixel resolution of 1.12 m/pixel. A cropped/rotated version is attached. Because we have images at different Sun angles, it is possible to determine the surface slope near the objects. The two most recent LRO images have Sun coming from opposite directions and at similar elevation but clearly the shadow lengths are different. Using trig, it turns out that -3.85 degrees in the Westward direction explains the different shadow lengths. This implies the height of widest one to be 10.3 m (since the widthwise 0.4m/pixel by heightwise 0.55m/pixel M159* image shows it to be about 11 m on the other two sides, this makes sense). However, using this height provides only a shadow of 83 m long for it. Examining M192* shows that perhaps the slope falls away even more beyond the nearby proximity of the widest object. Only 1.9 extra degrees is required to get the observed shadow length of 113 m.
A few months ago I posted what I thought was all we had regarding the Blair Cuspids imaged by the Lunar Reconnaissance Orbiter. I even took the reader on a tour, a trip to the BCs using the ASU ActReact Map. The image above is one of the best Earth-based telescopic images of the Sea of Tranquility. The area takes-in parts of four Rukl Sections. Upper left, Section 34 & upper right, Section 35, mostly. Lunar Orbiter II took some fantastic images in this area in 1966 while looking for a smooth landing spot for the then upcoming Apollo 11 mission which made history three years later in July of 1969. Prior to the LO imaging, Ranger 6 & 8 crashed (purposely) less than 75 km NE of Tranquility Base, and Surveyor 5 soft-landed about 30 km N, so all of the attention and U.S. presence was to the upper right. Not discussed much is the fact that Surveyor 4 was supposed to have touched down in the same area but never made it. But that's another story. If you look in the upper left you will notice four interesting craters SW of the "X". The largest crater is Cayley, a 14.3 km crater. Just to its north is a crater known as Ariadaeus B. To the right of that crater is a smoother area that, under higher resolution has some kilometer-sized craters (not visible here) where the enigmatic objects, the "Blair Cuspids", cast their long shadows. The location of the Cuspids, named after Boeing contractor William Blair, as you can tell in Figure 2, is just below dead center. Your monitor may display them as two very small dots no more than an eighth of an inch apart. 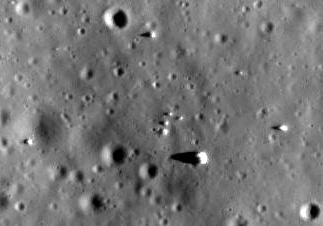 Extremely small (pencil dot size) and still almost centered and above a lighter newer impact crater, are the twin craters. Almost dead-center: Now much closer, three VERY SMALL craters can be seen but two are a little larger & sharper. Now lower in the frame and a little more to the right, below center. The 32 m/pixel res brings in 8-9 craters. Our target is the crater at the bottom of the tilted "C" pattern. The two craters are starting to show more detail. Now you can start to see debris in the right crater. The target area for the Blair Cuspids is SW of the right crater. Note the rectangular depression so well-defined in the original LO 2 image. The sun was coming from the right in the original images, but now the sun angle is higher and reversed, coming from the left. Note the boulders in the crater and the long shadow from the large one as the crater slopes downward. The same effect was noted in the originals but there was no such slope. The rectangular "trench"? Has the area changed any in the last 50 years? The same area of the Cuspids & mysterious "trench". If this is correct, then why is this ActReact composite so different than the three LRO images mentioned earlier in this paper? The sun angles are not the same and the images were very good, one at 0.5 m/pixel, but the "trench" area in the new image above is different and does not highlight the Cuspids themselves. So was there a fourth mission? One we don't have an M-strip on? Paul Davies & Robert Wagner of ASU proposed looking for ancient alien artifacts on the Moon. Was this the reason for LRO's repeated passes at different lighting conditions, or were the low pass missions just routine?